East River Park, part of the New York City Department of Parks and Recreation, is a public park located on the Lower East Side of Manhattan. 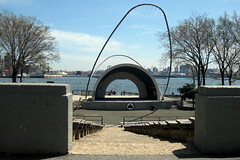 The park stretches along the East River from Montgomery Street up to 12th Street. The southern entrance boasts good views of the Manhattan Bridge and Brooklyn Bridge. 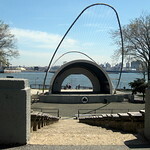 The amphitheater, built in 1941 just south of Grand Street, has been reconstructed and is often used for public performances. The park includes football, baseball and soccer fields, tennis, basketball and handball courts, a running track and bike paths including the East River Greenway. Fishing is another popular activity. The park is bisected by the Williamsburg Bridge.